A Mixed Bag of Photo Techniques, Climate Change and Damn Tired | Natural Exposures, Inc. Sometimes to get inspired to write I just have to let things flow. That’s what the first part (the top) of this blog is all about. The good stuff is towards the middle and below. Skip to that if you don’t care for my period of warming up. There’s a tip on wildlife ethics as well as the pros and cons of fullframe/non-fullframe cameras. To get you started here’s an image of what the middle and end is all about. I’m beat. Left for the airport this morning at 4:30am. Couldn’t sleep last night though I went to bed at 8:30pm. Got up at 1:30am with a funny feeling that something needed my attention. I open my Mac and and find an email from a potential Arctic Documentary Project supporter that needs more info on the ADP by 8:00am New York time. Now I know why I couldn’t sleep. Two hours later I send her a one page summary of what they might be getting into if they decide to support us. It was a huge favor by a new-found friend that works for one of the world’s leading corporations, and I was honored she was making the effort to pitch the idea to the powers that be. Tanya and I had a six-hour layover in Minneapolis. We fly into an airport with slush all over the runway. They had what many were calling a big snowstorm the night before. The snow was barely solid and most had already melted. Beads of water bolted horizontally across the airliner’s window as we made our landing. It’s raining in Minneapolis, Minnesota on March 1 in the middle of what is normally winter. Hard to believe. On our way to Amsterdam and I’ve been editing some of my Kenya material. I found a couple of images I wanted to share with you. One morning in Kenya, one of our favorite people, Judy Edgar, was lucky to find a Crowned Crane nest that had recently hatched two chicks. Being the the kind and considerate person Judy is, she thoughtfully offered to take her old Mentor to her special find. We pulled up on a swampy little patch of the Masai Mara National Reserve and there in the grass were a mated pair of Crowned Cranes with their two recently hatched babies. 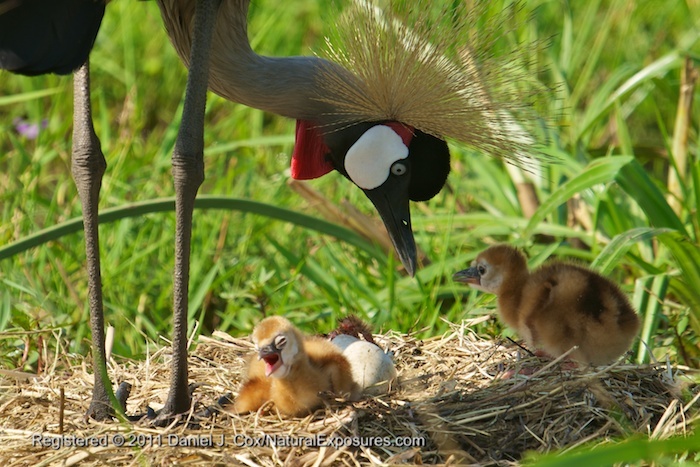 Crowned Cranes are spectacular on their own but with two chicks, it was a scene I’ll never forget. We sat and photographed this situation for nearly three hours. When it first began, the egg was completely whole, and by the time an hour passed the mother had pecked a hole in the shell and eventually the chick emerged. It was an amazing event to witness. We started from one side of the nest and eventually moved to the opposite edge of the swamp to see if there was a better view. We were rewarded with a virtually unobstructed perspective and this is one of the two images I captured. I was amazed at how little water there was in the swamp this mating pair had built their nest in. I’m hearing ever more stories about the Mara getting dryer and dryer. When flying from Nairobi it was hard not to be impressed with the lack of snow on the crest of Kilimanjaro. I was reminded of the changes I’m seeing in the arctic and the predictions scientists speak of that will start to be noticed around other parts of the planet. I’m afraid we’re starting to see it in the Mara already. On a lighter note, remember to always keep searching for just the right angle as long as it doesn’t affect the safety of the subject you’re documenting. This opportunity was a perfect example of why I shoot with a D7000 and a D700. When there’s good light, there’s no fear in using the smaller DX sensor camera. For this image I was using a Nikkor 600mm lens but on the D7000 it was the equivalent to a 900mm due to the smaller digital sensor. In this situation the D7000 was the perfect tool for the job. The light was bright and there was no need to shoot at high ISO’s that the D700 would have excelled at. Full-frame cameras have their place, but so do the smaller DX-sized bodies. Remember, all cameras, lenses, etc. are just tools of the trade. Pick the right one for the job and it’ll help you get the images you’re hoping for. I’ve always been a fan of the smaller sensor cameras even after Nikon’s D3 and D700 emerged. Both DX and FX sensors have their usefulness. Do you agree? Let me know your thoughts on so called full-frame FX or 1.5X DX sensors. Have the smaller sensors worked for you? Drop me a line here on the Blog. Would love to get your opinion. If you have any thoughts or personal experiences you’ve seen relating to climate change I would love to hear those as well. Kind of a mixed bag here. We have another hour until we land in Amsterdam. It’ll be 6:30am. Not sure what day it is but goodness life is interesting. Dead tired or not. I have always worked with 1.5x bodies, so for me they have always worked. But since the D300 is still not updated I am contemplating getting an FX body. The D7000 does not cut it for me. Small, low buffer and it misses that feeling for me that your handling a body. Maybe just a glitch in my head. I am getting the feeling Nikon will never upgrade the D300 (or at least it takes forever) and keep it with the D7000 so I am now slowly looking into FX, since the D700, D800, D3, D4 are bodies with a bit more punch. The D600 just got out, but that is essentially a D7000 with an FX sensor. But what keeps me wondering most about FX is the smaller AF grid, since I love working in the corners and the loss of that 1.5 crop. I know that at certain moments I will miss it, but at others I won’t. Maybe I should pair up as you did. My D300 grip works on the D700, both take CF so no need for buying a new load of cards. And both use the same batteries. Peter, thanks for adding your voice. I too used to be an avid non FX user but the difference in the quality of FX (full frame) images in low light finally won me over. Thanks for stopping in and adding your input. Pass the word to your photos friends about our Blog if you don’t mind. Always love to have as much input as possible.